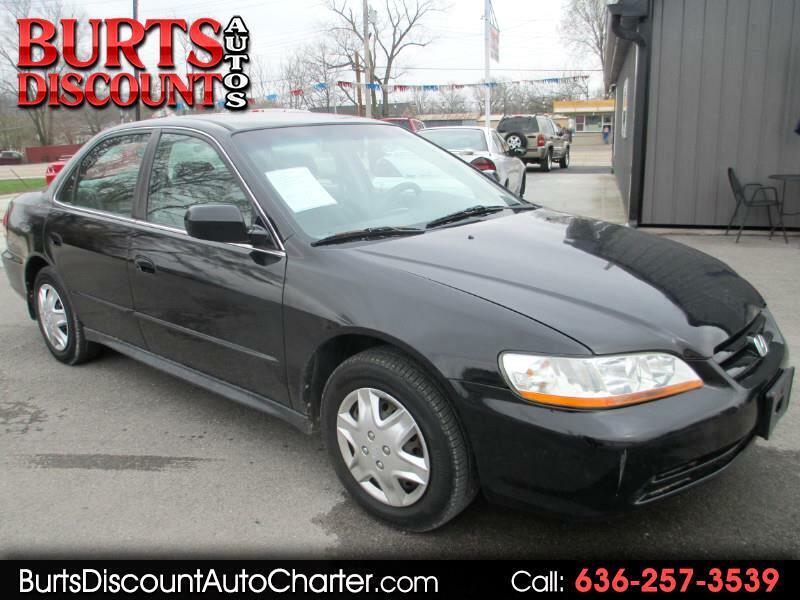 THIS 2002 HONDA ACCORD LX IS AVAILABLE ON THE LOT HERE AT BURT'S DISCOUNT AUTOS. THIS IS A NICE RUNNING AND SMOOTH RIDING HONDA ACCORD THAT FEATURES A 2.3L, 4CYL ENGINE WITH AUTOMATIC/FWD. ALL STANDARD OPTIONS ARE IN WORKING CONDITION. LOW MILES. THIS HONDA ACCORD LX IS SALE PRICED AT $4250 AND HAS ONLY 112K LOW, LOW, LOWER MILES. A 90 DAY/4500 MILE POWER TRAIN WARRANTY IS AVAILABLE THROUGH CARS PROTECTION PLUS..
*FINANCING IS AVAILABLE FOR THIS VEHICLE* !! ALL OF BURT'S DISCOUNT AUTOS COME WITH ALL PROPER INSPECTIONS AND...WITH A 30 DAY TEMP TAG. WE WOULD LOVE TO SPEAK WITH YOU REGARDING THIS OR ANY OF THE OTHER QUALITY AND AFFORDABLE VEHICLES ON THE LOT HERE AT BURT'S DISCOUNT AUTOS. GIVE US A CALL AT: 636-257-3539 OR VIEW OUR WEBSITE AT: www.burtsdiscountautocharter.com TO FILL OUT AN APPLICATION. The internet price shown is a cash only price and may be subject to change at anytime pending approval by our financial lender(s). Finance charges may apply. APPLY ONLINE NOW! Visit Burt's Discount Autos online at www.burtsdiscountautocharter.com to see more pictures of this vehicle or call us at 636-257-3539 today to schedule your test drive.